Welcome to Heaven's Requiem, a one-page tribute to Lenneth of the Valkyrie Profile series. Please keep in mind that there are spoilers in everything past the first section. 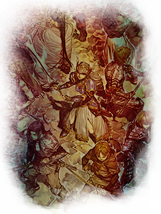 This site focuses on the A Ending of Valkyrie Profile, which it spoils about ten times over, and does not currently cover the other two games in the series. If you have any questions or comments, feel free to leave them in the guestbook. Enjoy your stay! This site is also home to the TFL-approved Lenneth fanlisting, located here. The following is all of the spoiler-free information on the Valkyrie Lenneth you'll find here. I hope that if you found it intriguing, you'll check out the fantastic game for yourself. One of the 3 Goddesses of Fate whose role it is to decide a person's fate after death. A mid-level goddess of the 6th rank, her true name is Lenneth Valkyrie. 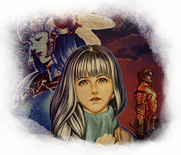 Valkyrie Profile was released on the PlayStation in 1999 in Japan and 2000 in North America. It's a fantastic mesh of RPG and platforming, set against the backdrop of Ragnarok, the end of the world. The Aesir — the gods — require human souls to serve as their warriors, called Einherjar, to fight against their enemy, the Vanir. As Chooser of the Slain, Valkyrie's task is to find souls worthy of fighting for the gods, and so the game follows her journey in doing so. The player gets to find out how each Einherjar dies and learn about them, which contributes to the story's depth, and the different modes of play and endings give it high replay value. The PSP release of the game in 2006 made it much more accessible (at the time); unfortunately it hasn't been released digitally since, so you'll still have to find a copy to play it. I do strongly recommend it, if you enjoy Japanese RPGS. If you'd like to learn more about the series, check out the about page at Seraphic Gate. A quick note: Lenneth can go anywhere on the world map from the beginning, and in order to get the A Ending the player must go to specific places during certain chapters of the game. This summary assumes that this path has been followed. Despite its large cast, Valkyrie Profile is very much Lenneth's story from start to finish. It begins with a brief prologue, in which we see a young girl, Platina, doing chores. She sees two strange men on her way home, and that night, her friend Lucian comes to her window and tells her she's been sold. He takes her away from her home and runs off with her. Lucian tells her that the same men came to his house in the past, and the next day his sister was gone — though it was said in the village she had died of an illness. Soon, they come across a valley full of beautiful white flowers. Lucian realizes quickly that they're deadly Weeping Lilies, but Platina doesn't care. All she wants to do is fall asleep and forget everything that's happened to her in her short life, like her parents' unkindness. Lucian desperately asks if she'd forget him too, but it's too late; she's inhaled the Weeping Lily pollen and dies in his arms. The game itself begins with a vision of an enormous church, with a woman in a wedding dress at the altar. The daydream fades out to show a beautiful young woman in a field, floating islands behind her — Valhalla, home of the gods. After the credits roll, the young woman — the Valkyrie Lenneth — goes in to see Odin, the All-Father and lord of the gods, and Freya, the Goddess of Creation. Odin tells her that Ragnarok, the end of the world, is at hand, and he needs her to go down to the human world, Midgard, and find suitable human souls to serve as Einherjar to fight against the Vanir. For the most part, the souls she collects are those of recently deceased humans, who she is to send up to Valhalla. Freya accompanies Lenneth to assist her as she's starting out and asks if Midgard reminds her of anything. Lenneth's response is that she's never been there before. For the first few chapters of the game, Valkyrie has a relatively easy time recruiting Einherjar and training them in dungeons, then sending them up to Valhalla to fight for the gods. In Chapter 4, though, Lenneth can experience a number of different events that start to shape her. Lenneth visits the Weeping Lily valley and finds a grave marker there, surrounded by spectres. She dispatches them and wonders why anyone would put a grave there. In Brahms Castle, Lenneth encounters the Lord of the Undead, Brahms, who has another Valkyrie trapped in a crystal. Lenneth challenges him, but Brahms calls her Odin's puppet and realizes she doesn't remember him, then gives her the chance to stand down. She does, and Brahms disappears. Next, Lenneth goes down to the town of Gerabellum, in the guise of a human calling herself Meril. A young woman called Claire sees her. Lenneth's silver hair makes Claire recall what her friend Lucian told her about his first love, a girl with silver hair. Jealous, Claire throws a rock at her. Her adoptive mother apologizes to "Meril" for Claire's behavior, and Lucian walks in. He stares at Meril, astonished by the resemblance. Later, he confronts Claire, who tells him it's hard to share him with a dead woman. The next major event comes when Lenneth goes to recruit an Einherjar, the headmistress of Flenceburg Academy, Lorenta. Lorenta is lured to an enormous tower by a former student of hers, Lezard Valeth, who has kidnapped her husband and transformed him into a monster. Lenneth arrives and slays him, then takes Lorenta's soul from her fallen body and proceeds into the tower. Once she reaches Lezard, he tells her he's made a homunculus to serve as a vessel for her soul, so that he can make her a human. He calls her his beloved and says she doesn't know what she is. Lenneth destroys the homunculus, then battles him. After he's gone, Lenneth goes to destroy the rest of his homunculi, but stops at the last, which is only a child. In the next chapter, Lenneth recruits a sorceress called Mystina. Mystina hears about Lorenta's death and goes to investigate Lezard's tower, finding the sole remaining homunculus there. She takes it back to her room and is soon visited by Lezard, who explains what he's discovered. His homunculi are half-elves, half-human and while most gods use elves as their vessels, the exception is Odin. As a half-elf, he was not static but rather could grow in power, and as such arose to the throne of the gods following the great war, then created the race of man. Lezard's discovery is that the souls of gods and humans are equivalent, and suggests that he might become a god were he to put his soul into one of his homunculi. Lezard leaves his homunculus with Mystina, and some time later tells her his ambitions are beyond becoming a god himself, then kills her. Mystina becomes one of Lenneth's Einherjar, though like another she recruited in the beginning, Arngrim, she cannot be sent up to Valhalla. The next Einherjar Lenneth recruits is Lucian, who is hesitant to join her and leave Claire behind but ultimately accepts. Before he's sent up to Valhalla, he tells Lenneth about his past and takes her to Weeping Lily Valley, where he asks her to remove her helmet. He realizes that she looks just like Platina, and that he still loves her, even though Valkyrie is a stranger to him. She kisses him and sends him up to Valhalla, and says that men and gods cannot love one another. Even so, she hopes she can see him again. After the next chapter, we see Lucian in the same field Lenneth was in at the start of the game. He's approached by two of the Aesir, Frei and Loki, and is asked what's troubling him. Lucian finds out that Lenneth sleeps in the form of a human when she's not needed as a Valkyrie, but that Freya sealed off her human memory so she wouldn't be distracted from her duty as the Valkyrie. Lucian, having finally caught up with the audience to realize that Lenneth and Platina are one and the same, asks if there's any way to remove the seal. Frei tells him there isn't and leaves, but Loki tells him he could still contact Lenneth. Loki takes him to the Water Mirror, and he calls out to her. She hears him and is furious that he's using the mirror. Lucian sends her an earring and tells her to find the other one, but she's too angry to agree and tells him what he did was unforgivable. In the meantime, Loki has stolen the Dragon Orb, the pillar of Midgard, and kills Lucian to frame him for the crime. Following the next chapter, Lenneth is informed of Lucian's death and told to retrieve the Dragon Orb, and we see how Odin and Freya found out about the theft. Though they are suspicious of Loki, they have no proof he's lying, and resolve to eliminate him should he betray them. Lenneth searches for the orb, but cannot locate it. Lenneth then goes to the Weeping Lily Valley and finds the other earring buried next to the tombstone. She's unsure of how she knew it was there, but she's surrounded in dark light. When it fades, another Valkyrie with purple armor is in her place — her sister Hrist. Two of Lenneth's Einherjar, Arngrim and Mystina, find her there, and Hrist demands that they serve her, which they refuse. Hrist tries to destroy them, but Lenneth protects them with the last of her powers. Hrist vanishes, and Mystina realizes that the wisps of light floating around are what remain of Lenneth's soul. A voice tells her to freeze the air around them, and Mystina crystallizes Lenneth's soul. Lezard appears and tells them he knows how to save Lenneth, and though they don't like it they accept his help. They put Lenneth's soul into Lezard's homunculus for the moment. They then go to Brahms Castle to retrieve her true vessel from Hrist and find her challenging the vampire. Brahms realizes Hrist has awakened too soon and joins forces with them to defeat her. Hrist is forced out and her form fades into lights, which Mystina crystallizes. They return to her room and fuse the homunculus with the vessel, restoring Lenneth. The seal is broken, and memories flood through Lenneth of things she's been through both as Platina and Valkyrie. She breaks out of the illusion and, in despair, returns to the Weeping Lily Valley to look for the earring — all that she has left of her beloved Lucian. Meanwhile, Loki goes to Surt, leader of the Vanir, and asks for him to join him. Surt declines, and Loki destroys him, then goes to lay waste to Valhalla. Lenneth returns to see it in flames and finds that Odin has fallen to Loki, and Freya is weeping over him. Freya tells her they must rally the gods, but Lenneth refuses to do as she orders anymore. She asks Freya why she can't feel the same way about humans and receives no response. Lenneth finds Loki atop Asgard Hill, and he demonstrates his power by obliterating all life on Midgard. Lenneth despairs at their loss and turns that sorrow into power. The power of creation flows through her, and she restores life to Midgard. Just like Odin, Lenneth is able to grow because she's become a half-elf. Through that power, she defeats Loki. She wonders if she'll ever understand him, and a voice says that she already does. She turns to see Lucian and embraces him, knowing that all will be well now. Lenneth is something of an enigma to most of her Einherjar. She appears at the end of their lives and offers them the chance to fight for the gods. In some instances, she grants them a final wish, while in others she's a much harsher goddess. But she does not appear to confide in them or do anything past that which her role requires. Her Einherjar don't even know her true name — to them, she is simply Valkyrie, the Battle Maiden, Chooser of the Slain. Underneath her role and the titles, though, is a complex woman. In the beginning of the game, Valkyrie's focus is solely on her mission, and she treats each Einherjar recruitment as a routine mission, no matter what she encounters in the process. When recruiting Jun, for example, she faces him as an ogre who questions what she will become. Ogre: And what will your soul project upon this dark cave? Valkyrie: Soul? I possess no such thing. And yet, as we discover in great detail through the course of the game, Lenneth is very much in possession of a soul, and more than the Chooser of the Slain. Lenneth shares her soul with her two sisters, Silmeria and Hrist, though only one can inhabit the Valkyrie vessel at once time. While one is fulfilling the role of the Valkyrie, the other two are reborn as humans. In Lenneth's case, she is born into a poor family in Coriander Village and called Platina. She lived a brief, difficult life, and when it came to an end, she welcomed death and hoped reincarnation would bring her happiness in her next life. Finding happiness, however, is not in the Valkyrie's job description, and even less so with Ragnarok at hand. Despite that, Lenneth finds herself drawn to certain people and places, though she doesn't understand why. And it's through these incidents that we start to see more than the dutiful Battle Maiden. She offers Llewelyn comfort for leaving his beloved, despite her not being a goddess of love. She's horrified at Lezard's attempt to make her his, and at his homunculi. She's honestly curious about Lucian's past and tries to understand his love for her, even while accepting that it cannot be. And yet it's not enough to break the seal of her humanity. Lucian's death is the catalyst for that, and we see Lenneth recall all she had forgotten and realize just how much she's lost with Lucian's death. This anguish is the first real humanity we see from Lenneth, without the strength that has so far defined her. From this point forward, Lenneth abandons her duty to Asgard. The cause she fights for is herself and those she cares about — all of humanity. The true Lenneth, made up of both her experiences as a human and as a valkyrie, is a woman who cares deeply for both humans and their world, perhaps even more than her fellow deities. And she has the strength granted to her through her half-elf vessel to rise above her limits and restore that world in its moment of greatest peril. She does her duty, the same as what her story began with, but she's rewarded with both her beloved and the capacity to love. She has found what Platina dreamt of. Lenneth's character development is fairly straightforward: she starts out dedicated to her task, and comes to realize that there's more to life — and herself — than are evident at first glance. And yet, no matter how many times I replay the game, I find her story just as compelling as the first time I saw it. Lenneth's world and her place in it are beautifully developed, and when it all comes crashing down, her pain is that much easier to understand and identify with. The Battle Maiden, a paragon of virtue to her Einherjar, is ultimately just as human as them. The story of Valkyrie Profile boils down to Lenneth's search for her identity, even when she doesn't know it. She believes that she's searching for the best warriors to serve as Einherjar, and she does, but there's more to it than that. What Lenneth is unknowingly searching for is the value of her humanity, and finds it in her Einherjar. She sees lovers sacrificing themselves for their beloved, warriors trying to find more in death than they did in life, and people from all walks of life accepting their journey to the great beyond. The only reason Lenneth doesn't translate it to her own life is because she considers herself removed from these human affairs by virtue of her role and lack of memories of her own human life. Some of Lenneth's Einherjar recognize this in her, if only in part, and ask the human questions, to which Lenneth can only give a goddess's answer. Aelia: You went through a lot of trouble for me, but... Why do the gods need human souls to fight for them? Why can't they do it themselves? You're Gods, aren't you? Valkyrie: Though your body may be bound, no physical restraints can shackle your spirit. It is this trait that we recognize within you. Aelia: I see. So you admire humans. You haven't answered my question, but surely you'll keep your promise. Arngrim: I have one question. Aren't you just a death goddess? Valkyrie: Yes. However, you must walk it on your own. Lenneth certainly shows a certain level of admiration in some of the qualities she sees in humans, such as compassion and tenacity. And yet, despite the fact that she exhibits such traits herself, she doesn't recognize them. As the in-game info helpfully declares, she is a goddess and does not have human traits. Even after she's seen her Einherjar go through so much and seeking to understand Lucian's feelings for her, when it comes down to it she rejects these human emotions. Valkyrie: What happened here? You think I will forgive you for taking such liberties!? Valkyrie: Lucian... what is this? Valkyrie: What do you mean? That's why you used the Water Mirror?! Valkyrie: ...How will I? You dare order me to go treasure hunting? You're a fool... Now that you have done this, have you any idea of the repercussions? This was... This was... Unforgiveable!! Although much of Lenneth's search has been through Lucian, his asking her to do this very human thing for him is something she can't accept. No matter how he feels about her, and her own desire to understand it, she won't bend down to this human level. Hers is a much nobler role. So she continues in her work, ignoring his request and recruiting more Einherjar. What makes her acknowledge him is the report of his death. Unlike all of the other deaths she's seen on her journey, his actually moves her. She doesn't understand why, but it's enough to break the seal on her memories, and finally realizes the truth about herself. Through this, Lenneth grows from being a goddess concerned only with her duty to a woman who feels true compassion for humans. She accepts her own humanity and former life as one, and through that, she finds the strength to restore Midgard. Imagine for a moment that everything you've ever known about your place in the world has been torn to pieces. Who you are and what you are — things you've never questioned before — now lie in ruins. The only thing that is constant between your old life and the new is a single person, the one who loved you, who risked everything for you. For Lenneth, it's Lucian. His is the name she cries out when everything comes crashing down on her. It's the valley he took her to she goes to in order to find his final wish. It's him that drives her through Valhalla to Loki. And it's his arms that embrace her in the end. The first time I saw the ending, I thought it was kind of lame. I mean, it was only after he died that she realized what he meant to her, and they got the happily ever after in the end. Kinda clichéd, really. But what I've come to realize is that Lenneth's love for Lucian is ultimately what gives her humanity. As a human child she loved him, as a Valkyrie she sought to understand him (and scorned him when he proved too human), and reborn, she found her love for him once again. She could not have gone from the first point to the last without losing him and discovering herself. Each of these points is fundamental in their relationship. As Platina, her closest friend is Lucian. Though we don't see much of their time together, she trusts him enough to follow him and accepts what he tells her. But though she cares for him, she recognizes that even though they've escaped being sold, there's no future for them. Platina is not a girl who's ever known hope in her life, but she can hope that the next will be better. (She actually treats Lucian pretty terribly, caring nothing for what he wants and leaving him to feel guilty about his death, but that's an issue to discuss at a later date.) She passes away, but she remains an enormous part of his life. He tries to move on, but he can never quite forget her, which puts an enormous strain on his relationship with Claire. There's no competing with a dead woman. And once she takes her place as Valkyrie, Lenneth has no interest in romance, and certainly not with a human. She finds his love for her interesting and humors him in reliving how they escaped from the village. It means everything to him, but she sees it as nothing more than a brief flight of fancy, one that can never be made into an actual relationship. Once he's sent up to Valhalla, she doesn't concern herself with it, past hoping they might be together one day, just as she did as a human. Yet she utterly rejects him, unwilling to tolerate his frivolous use of the Water Mirror. Only after she hears what happened afterward does she decide to acknowledge it. In the end, though, it's what she needs for her memory to be unsealed. It's the most painful thing Lenneth has ever experienced, but it's because she knows who she was — and who she is — that she can face Loki and restore Midgard. Lucian is the reason for her to change and grow beyond simply being a "death goddess." And in the end, they can finally be together. Despite her own failure to abide by Valhalla's orders, Hrist serves as a foil for Lenneth. While Lenneth has an interest in humanity even before her memories are unsealed, Hrist cares nothing for them and sees them only as warriors to fight for the gods. This is made most obvious by her immediate demands of Mystina and Arngrim to obey her. Hrist: That's right. I am one of the 3 Goddesses of Destiny. My sisters and I control the transmigration of souls. It was my sister, Lenneth, who Odin chose to handle this realm... But now he has judged her to be unfit for the task. Arngrim: I can't accept that. Hrist: And, what do you intend to do? Arngrim: I refuse to obey you! Mystina: Me too! If you had been the one to ask, I would never have joined you! Obey you?! You've GOT to be kidding!! Lenneth's Einherjar are loyal to her, beyond her duty to Valhalla. While Hrist might be the model Valkyrie, Lenneth's the one to actually get trust from her Einherjar — enough for them to risk their lives to save her. Hrist may be the Valkyrie, but she's not their Valkyrie. As for the player, Hrist's behavior makes it quite clear that Lenneth is a unique Valkyrie. She possesses the same will to fulfill her role, but she also has the capacity to be more than that. Thought he Valkyries never interact on account of sharing the same body, one can't help but wonder how they would. This is a site I've wanted to make for a long time. I first seriously thought about making it happen in the fall of 2009 as part of the girl mode marathon at Amassment, but due to time constraints I ended up only making a site for Mystina. I knew I still wanted to do something for Lenneth, though, and here we are. ♥ Valkyrie Profile has been one of my favorite games for ages, and I've loved Lenneth since the first time I played it. Watching her develop over the course of the game is an incredibly rewarding experience, and I'm glad to have a place to talk about her. If you have any questions or comments about the site, please feel free to leave a message in the guestbook. The site's name comes from a track on the Valkyrie Profile Voice Mix. I was a bit stumped on a name, so I started looking through the VP albums. Once I spotted this name, I knew it was the right fit, because Lenneth's story is about the twilight of the gods (Ragnarok) and the end of her own illusions about who and what she is. It doesn't hurt that the name is really pretty. The layout came together after a lot of arguing with Photoshop. Apologies for the ridiculous load time if you're on a slower connection; I went all-out since I knew it was going to be only one page. Resources come from vert_gazon, FEEL, Hybrid Genesis, masterjinn, and the defunct lovelytrash.org. Images come from my own caps, Anime Paper, and Minitokyo. Quotes come from the game FAQ by SYusup. 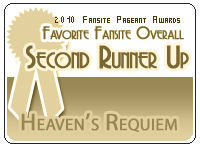 This site was honored to be tied for second runner up in the Favorite Overall Fansite category of the 2010 Fansite Pageant. My thanks to the nominators and voters! I'd love to affiliate with any site for a female character from a Japanese RPG similar to Lenneth. Just contact me! Sadly, there are very few Valkyrie Profile sites. Drop me a line if you know of any others! If you'd like to link back to this site, feel free to use one of these buttons. no infringement intended. Heaven's Requiem and its original content is © Larissa, 2010-2019.